This Mine Botanicals Skin Lightening Whipped Shea Butter review focuses on the features of the product which every good skin lightening products should have. This is a natural product that contains ingredients to reduce extra pigmentation on the skin. Dark spots and discolorations should reduce in appearance with the use of this product. The end result should be skin clarity and translucency with an even skin tone. Each of the natural ingredients contributes to the underlying health of the skin cells by providing them with vital nutrients they need for regeneration and with antioxidants. Antioxidants reduce the levels of environmental damage to the skin which is often the cause of excessive pigmentation. The olive oil and shea butter also help to lock moisture within the skin cells so that they can use it for their daily functioning. These ingredients are natural and gentle and do help to prevent excessive pigmentation but we don’t see any ingredient on this list that acts specifically to reduce levels of melanin, the pigment responsible for dark spots. There are several natural ingredients that could be used for such a thing like alpha arbutin or kojic acid. Without these ingredients it is highly unlikely for this product to be anywhere near as effective as its competitors that have these ingredients. According to the manufacturer, the best time to apply the product is after a bath or shower. Apply some on to the hand and then massage into the skin of the face and arms if necessary. 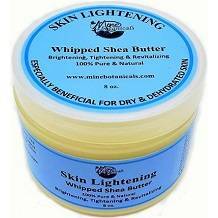 An 8 oz container of Mine Botanicals Skin Lightening Whipped Shea Butter will cost $7.99 when purchased from the manufacturer online. This price excludes shipping or local taxes and there does not appear to be any sort of subscription service for receiving a regular order. Customers can however sign up with the manufacturer to receive reward points for the money that they spend with them. The price of this product is quite low but we believe this is because of the lack of potent ingredients and the inclusion of easily available and standard ingredients. There is some evidence that the manufacturer accepts returns because customers can fill out an online form providing the relevant details. However there is no mention of the limit of time before the returns policy expires or if there is a particular condition the product has to be returned in to qualify. This product is one of the cheaper skin lightening products that we have reviewed. There is a possibility that customers might be sacrificing on quality when they buy this product though. There are no potent natural ingredients for skin lightening in this product and the manufacturer does not provide information about the returns policy. All in all the quality of this product seems to be quite low, especially compared to other manufacturers which have better ingredients and offer a satisfaction guarantee for the customer’s money back if they are unhappy with their results.